Although there is plenty of information that we will share, our aim in this programme is to explore your ideas with you. We will create opportunities for you to access employers and scenarios that will challenge your expectations. We’ll enjoy learning with you as you get to know your strengths and ambitions. And we’ll guide you and support you in developing your own plan for your future. Stay tuned for the next Reasons You Should Attend GCEP blog posts, which will be posted over the upcoming weeks, all based on actual student feedback we received last year. For more information on our Employability Pathway, please visit https://www.ucl.ac.uk/global-citizenship/programme/pathways/employability or our website to register. For more information on the general Global Citizenship Programme, please see https://www.ucl.ac.uk/global-citizenship/programme. Thinking about careers for many people can feel quite daunting. Often this is because they haven’t had an opportunity to learn how to manage and plan their career. Without this groundwork, choosing a career can feel like guesswork. The Global Citizenship Employability Programme uses a series of workshops which build on each other to provide students with the skills and information that they need to take control of their graduate job search. Finding a great job is not just about knowing what the employer wants from us, and delivering that. Its also about understanding our own drives, values, strengths and motivations. After all, one person’s perfect job is another person’s mistake. On the Global Citizenship Employability Programme we will explore the graduate recruitment market, working to understand the employer better and what they are hoping to see in the application and interview process. Through workshops, discussions and coaching, we will also be exploring aspirations and values developing a better understanding of what working environments and roles will be likely to suit us. 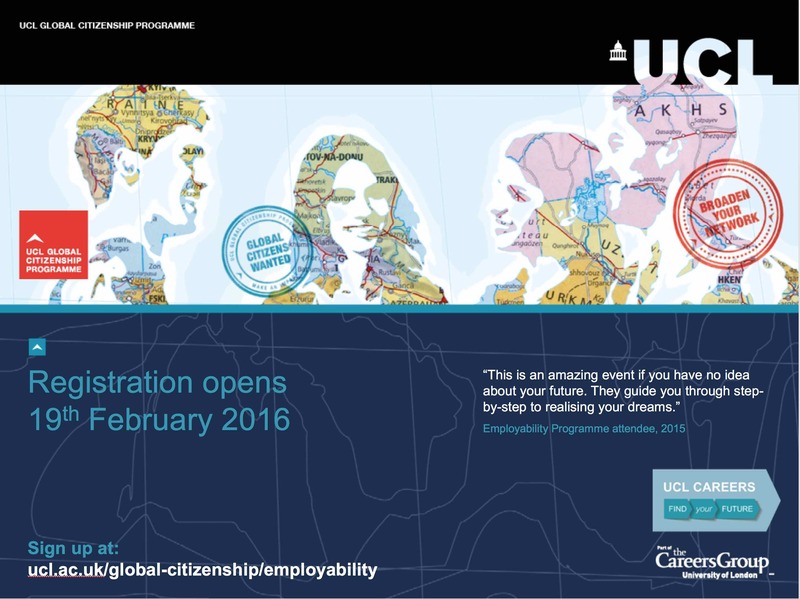 The Global Citizenship Employability Programme (GCEP) returns – what’s new this year? 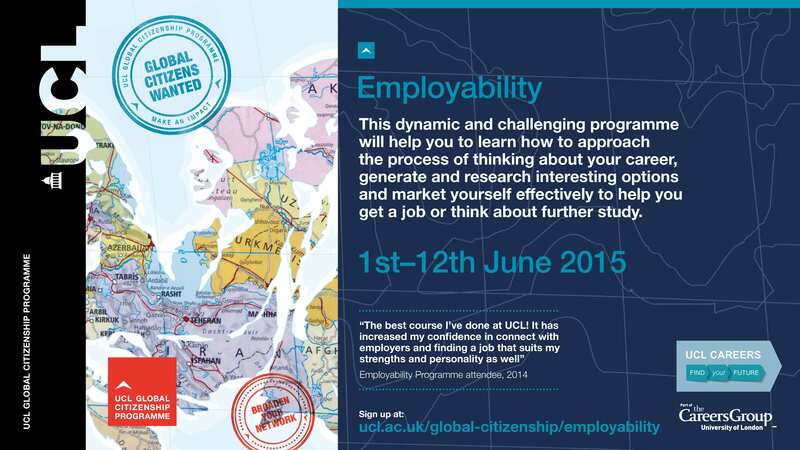 Registration for UCL’s Global Citizenship Employability Programme is now open. This exciting two week course is designed to empower you with the knowledge and skills needed to successfully approach employers, apply for jobs and secure your desired role. This is a unique chance to get ahead in today’s international, competitive job market. New to the programme this year, a broad range of employers who value Global Citizenship will discuss with you what Global Citizenship means to their organisation and how these values translate into actions. 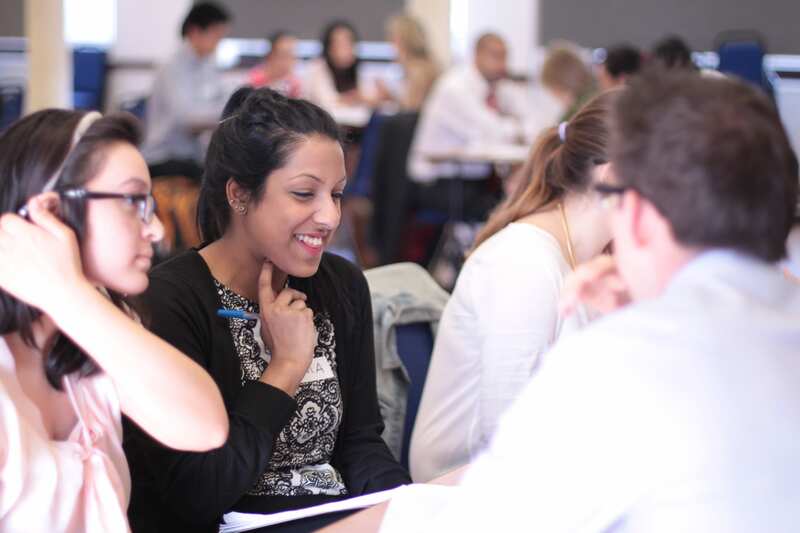 From panel sessions and group discussions to one-to-one coaching with employers, you will get the chance to explore what Global Citizenship means to you, how other UCL students see the world, and which employers you may want to work for in the future. Whether you are new to the idea of Global Citizenship or already have a strong view, join the discussion and learn how to relate these values to your future career. 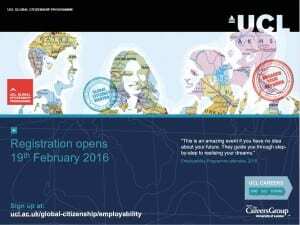 Register now at My UCL Careers. On Friday 19th February UCL’s 2016 Global Citizenship Programme launched, and undergraduates and postgraduate taught students across UCL will be able to register to take part in one of the different programmes taking place from 31st May-10 June. It’s made up of 10 different strands to choose from: 6 Grand Challenges targeted at first and second years only, and 4 more Pathways open to second years, penultimates, finalists and postgraduate taught students. The Global Citizenship Employability Programme (GCEP), run by UCL Careers, is one of these latter strands – so if you are thinking about what your future may hold beyond UCL, read on! Over the course of the fortnight you’ll tackle all parts of the job search: from initial self-reflection right through to every aspect of a selection process. This is a unique chance to get a real range and depth of experiences on how to proactively approach employers and effectively search and apply for your chosen roles within any industry, to make the most of UCL’s global university status. You’ll learn about Global Citizenship from an employer’s perspective, understand how your values might coincide with those of businesses and organisations and be introduced to ways of bringing the values of Global Citizenship to life in careers ranging from global charities and NGOs to large multi-national commercial enterprises. The two week programme involves a mix of workshops, talks, panel sessions, networking events, and personalised one-to-one coaching with employers, Careers Consultants and UCL Alumni as well as priority access to the end of year jobs fair. Don’t just take our word for it – check out our video and hear from attendees at last year’s programme. Most of all, be sure to register and come to UCL Careers to pay your £20 deposit to secure your place! Graduating from Physics I wanted to pursuit a Technology career in the city. In previous summers I had obtained relevant work experience through internships but hadn’t converted them into full time positions. I knew that applications opened in late summer and lasted till around the New Year and my aim was to work hard applying over this time period. Furthermore through the course you are introduced to the many other services that UCL Careers offers, such as the Alumni programme, 1-1 sessions, careers fairs and workshops. Through the Alumni programme I was able to obtain contacts within the industry/organisations that I was applying for, which was invaluable as you really get to understand what it is like to work for these companies and in these careers. Finally and most importantly I was introduced to the great team at UCL Careers and found the consultants very helpful in getting advice. Applying what I had learned from the Employability programme, I started making progress with my applications, securing interviews with firms I really wanted to work for. I found it extremely beneficial to practise for interviews with the consultants, it helped build confidence and I received useful tips on how to improve. I always felt that the consultants came well prepared with relevant information about the types of questions that might be asked and about how the interview process would be carried out. All this soon resulted in securing a job as a Technology Analyst at an Investment Bank. Much hard work was required on my part but the advice and support I received through the careers service really made it easier, with all the tips and hints along the way, that are difficult to pick by yourself. Even if you are very confident, there is no harm in reaching out to these guys, you will definitely learn something new that will benefit you in your job hunt. Good luck! It’s over! UCL Careers has just finished running the two week Employability Summer School as part of the Global Citizenship programme. Taking place over two weeks, from 2 – 13 June, we saw over 70 penultimate and final-year students, from a whole range of different departments, go through the fortnight building upon their skills as well as improving their confidence in the job hunting process. With over 20 interactive events tackling a whole host of topics, it was an intense first-time experience for many – the days were jam-packed with information, guidance and plenty of opportunities to put it all in to practice. 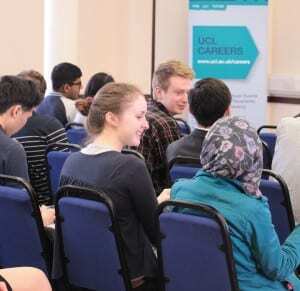 Beginning with an ice-breaker to get things going, students kicked off the programme with a day looking at how to connect with employers – a session rounded off with an opportunity to chat with a UCL Alumni panel and network afterw ards. The following day’s workshops focused on CV and applications as well as interview techniques and ended with a chance to speak to start-up businesses at the Small Companies Big Jobs fair. The week was then split in to sessions full of tips on online job searching, psychometric testing, mock assessment centres, post-graduate study and international job hunting with plenty of 1-1 coaching interspersed. Throughout the week, mornings were spent with varied plenaries from Capco and Save the Children which were engaging and insightful. Week two followed a differed flavour with a group ‘job searching’ session and an opportunity to put everything they had learnt in to practice at the annual UCL Careers Jobs Market. The students then divided up over the next three days with some attending the case-study-centred ‘Focus on Management’ and others developing strengths-based skills at the ‘Marketing yourself as a Global Citizen’ strand. The last day was dedicated to action-planning and forward thinking as well as a chance to celebrate the past two weeks – rounding out a successful programme of workshops with an HEAR accreditation and a well-deserved lunch. What did they build their confidence in? They then filled this same indicator out on the last day and compared them both – the idea being that they’d hopefully see an improvement from their first day. It is safe to say that there was a huge improvement! Every one of these pointers saw the numbers rocket from a score of around 1-3 to a confidence-inspiring 4-5 by the final day. Proving the value of all they had picked up over the two weeks, students felt that going forward, they were more ready and able to approach the job search armed with the right information and resources, as well as the support of UCL Careers in the months and years ahead. 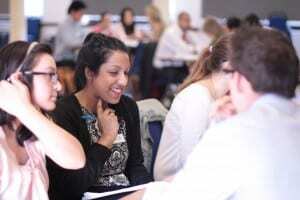 What did students think of the Summer School?